A stunning ceiling chandelier with a gold sheer shade and champagne crystals and an antique brass finish. Frosted glass inner shade with outer brushed nickel finish frame. Ceiling plate fits over existing openings measuring 5 inch diameter. Unscrew bottom finial cap on frosted glass light diffuser to clean or replace bulbs. The Eglo Tenno Ceiling Light in an antique brown finish complimented by genuine lead crystal is equally suited to traditional and transitional settings. This unique square ceiling light is approximately 11.5" wide and deep by 5" high. 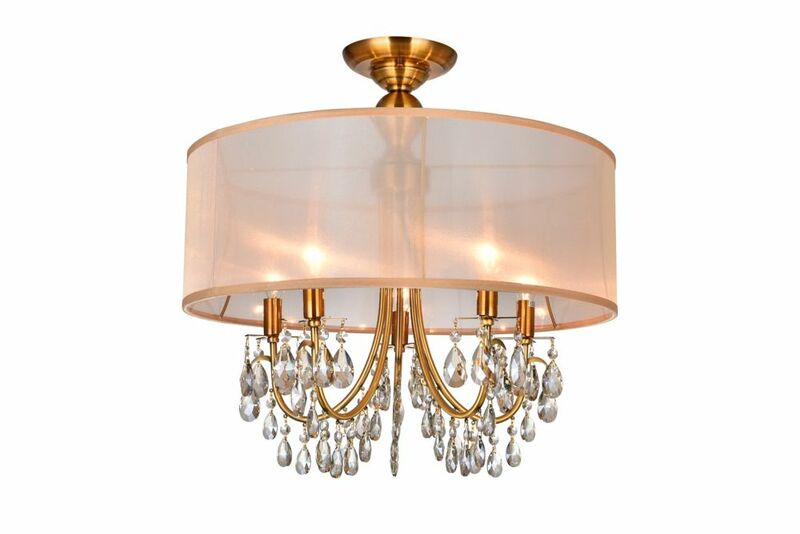 Consider this ceiling fixture in place of any standard flush mount for the kitchen, bedroom, hallway, den, or office. Use four G9 type bulbs, max. 40W each included for your convenience. This light fixture can be used with any standard 120V dimmer for the widest flexibility of light output. 22 Inch Round Antique Brass Fixture With Gold Shade A stunning ceiling chandelier with a gold sheer shade and champagne crystals and an antique brass finish.